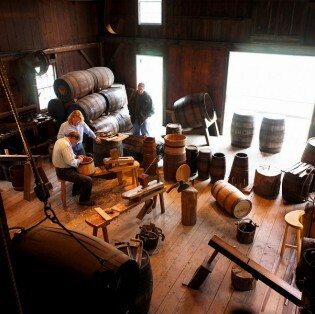 The cooperage was a shop where round wooden containers, which we generally call barrels, were manufactured. These casks were an essential element in life both at sea and ashore, and wooden containers made from staves and hoops served many storage purposes. Aboard ship they held provisions, various kinds of cargo and, on certain fishing and whaling vessels, the catch. 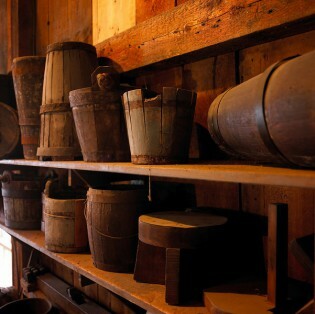 Casks intended for spirits, molasses, whale oil, or other liquids had to be tight–that is, water-tight–and the cooper who made these types of containers was a “tight cooper.” Slack casks were used for flour, potatoes, apples, crockery and just about anything else that might have to be shipped from one location to another. A cooper was a regular member of a whaleship’s crew. His responsibility was to assemble pre-made casks as they were needed to hold the valuable whale oil, and he was held responsible for leakage as well as accuracy of measure. The building in which the exhibit is housed, once a barn on the Thomas Greenman property, has been modified to include typical features of a cooperage: a hearth large enough to work in while firing casks, a crane with a block and tackle and chine hooks, and a loft for storage. When is a Barrel not a Barrel? When it is a hogshead or a tun. That is why the proper term is cask. A barrel for wine or whale oil is a cask holding 31 ½ gallons. A barrel of petroleum, however, holds 42 gallons. Larger than a barrel, a hogshead typically holds 63 gallons, but by some measures can hold up to 140 gallons. The largest cask that was practical to transport was the tun, which held approximately 252 gallons (weighing approximately 2,000 pounds, or a ton). But of course all of these containers were built by eye, so each one had to be gauged with a special measuring rod to see how many gallons it really held. 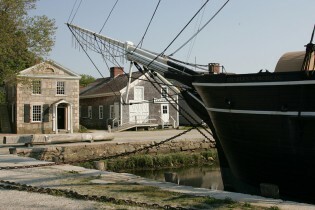 The Mystic Bank (left) and the Cooperage (right) behind the whaleship Charles W. Morgan at Chubb’s Wharf.